HomeDrawing Sketch like a pro! When you think about sketching what comes to mind? A child’s art class? The beginning of a professional artist’s masterpiece? Sketching is not an act that should be limited to those in the art business. Sketching is a great tool that can be beneficial in any industry or your day to day life. It’s an excellent way to extract creativity from your mind even if you’ve never considered yourself the creative type. 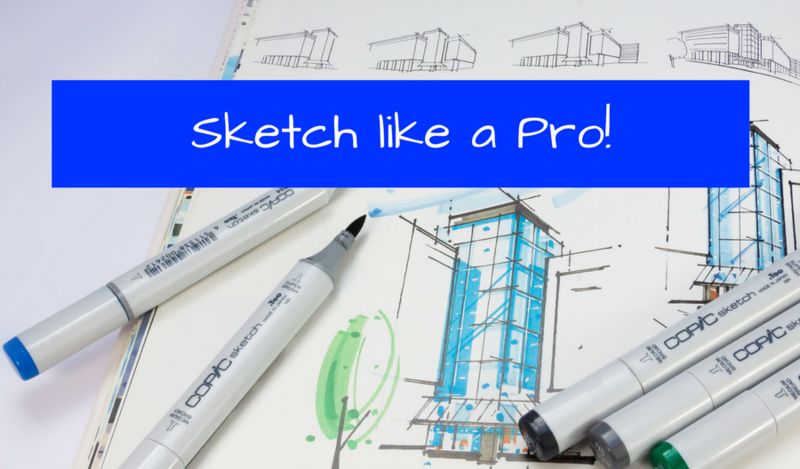 Read on for a few ways sketching might benefit your business and everyday activities. So what is sketching exactly? To put it simply sketching is a form of brainstorming. Most people think that sketching is limited to drawings but that isn’t the case. You can use a combination of sketches and drawings along with text to help you put your ideas down on paper. For those of us who aren’t gifted with the creativity gene, sketching is a great way to extract ideas from your mind that you didn’t know existed. Letting yourself write and draw freely whatever comes to mind is a great way to find your inner creative. Check your sketchbook periodically, going back to older drawings you’ve done in the past. On occasion you’ll see something that you didn’t notice at the time you were putting the sketch down on paper. Sketching for business and collaborating as a team. Sketching in the world of business can be a great team building exercise. Individuals can pass around a single notebook or bring their own sketchbooks with individual designs to collaborate. Encourage members of the team to mark up each other’s sketches, adding details freely in order to create the end picture. The great thing about bringing different minds together with sketching is that everyone will have a different take on the sketch; pulling their own unique ideas from the drawings and text. This is a great way to come up with fresh new ideas completely from scratch. Sketching is also a great way to unite those with different learning styles as a team. Some people benefit from visuals while others prefer words and text; sketching combines the two into something everyone can benefit from. Believe it or not drawing is actually a highly effective relaxation tactic. Sketching forces your brain to focus on the task at hand helping you put those external stressors you might be worrying about to the side. Stress can be detrimental to your health so it’s important to make sure you set aside time to distress and relax when life is feeling hectic. Forget the apple! A sketch a day might be the key to keeping the doctor away. Sketching might seem primitive in today’s digital age but there really isn’t a replacement for good old fashioned pen to paper. You don’t have to be an artist or creative genius to get into sketching; all you need is a sketchbook, a little time and a pen or pencil and you’re ready to go. Happy sketching!